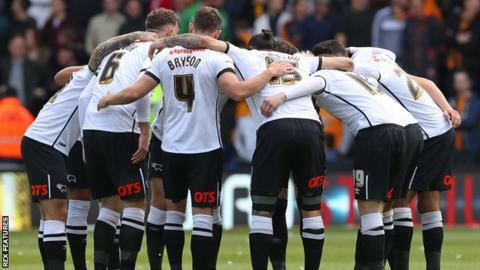 Derby County boss Darren Wassall has defended his team selection for the Championship play-off semi-final first-leg defeat against Hull City. Bradley Johnson replaced George Thorne, with Will Hughes in a deeper role. Asked following the 3-0 loss if he regretted that decision, Wassall told BBC Radio Derby: "No, not at all. "Bradley played against Hull a few weeks ago and scored two goals in that position and Will played very well against Sheffield Wednesday." Midfielder Johnson was brought in after Thorne suffered a broken leg during the recent defeat by Ipswich. He struggled against Hull, giving the ball away in the build up to the opening goal, and was substituted in the second half. "Hindsight is a wonderful thing. I don't think the selections caused that result," said Wassall. "We haven't performed as we have been doing over the past six or seven weeks when it matters." Wassall also defended his decision not to make attacking changes earlier in the game. Nick Blackman came on in the 71st minute and was eventually followed by fellow striker Darren Bent, whose late introduction was quickly followed by Hull's injury-time third goal. "We were conscious that it's half-time in the tie and the one thing we didn't want to do was to go and concede a third goal," said Wassall.